This is called Philippine Needletail int he Kennedy guide. The Kennedy guide lists this bird as fairly common but becoming rarer. Birdlife International considers it as "Near Threatened, as it is thought to have a small population which is declining owing to habitat loss." 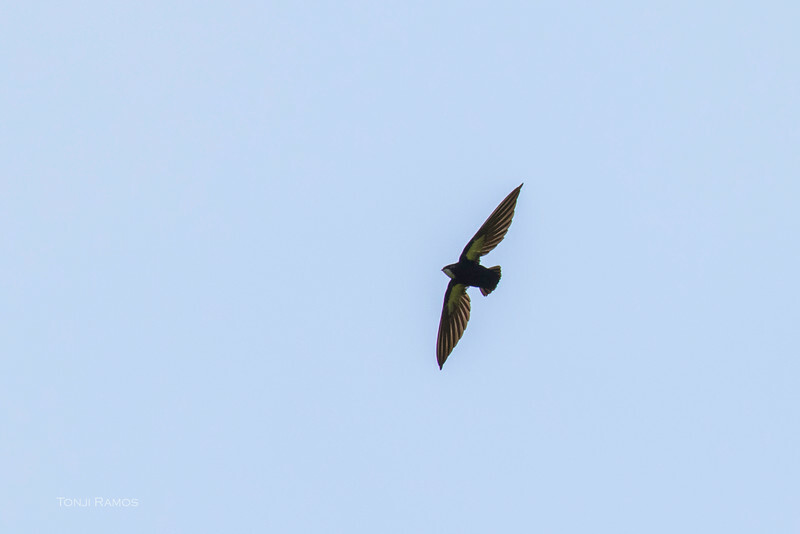 It is a small Needletail and it is very fast. It drinks water on the fly, skimming the surface while drinking. It was not the easiest bird to photograph because of it's small size and speed. It is, however, easy to identify with its short body, bluish color and white patches in the throat and underwing. My big rig was useless taking these fast fliers.Thanks to Clemn Macasiano who lent me his small 400mm 5.6, I was able to get one decent shot. Sylvia who is a whiz with her rig got several photos that show the distinctive white markings under the wings and on the throat.